In medium bowl, stir together Bisquick mix, granulated sugar, nutmeg, 2/3 cup milk, the egg and 1 teaspoon vanilla. Fold in chocolate chips. Spoon batter into pan, using about 1 tablespoon for each doughnut. 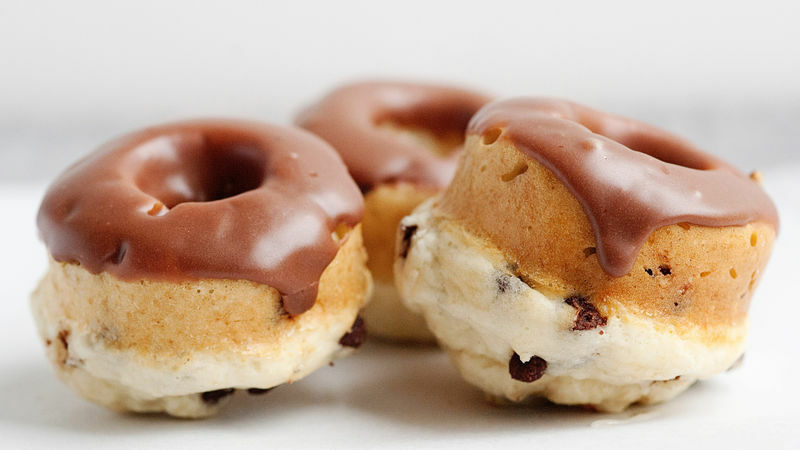 Dip tops of doughnuts in glaze. Serve warm. Substitute cinnamon-flavored baking chips for a spiced variation; make a vanilla glaze by omitting the cocoa. Decorate the glazed doughnuts with candy sprinkles, if desired.